Sr. Asst. Prof., Dept. of CSE, GMR Institute of Technology, Rajam, INDIA. 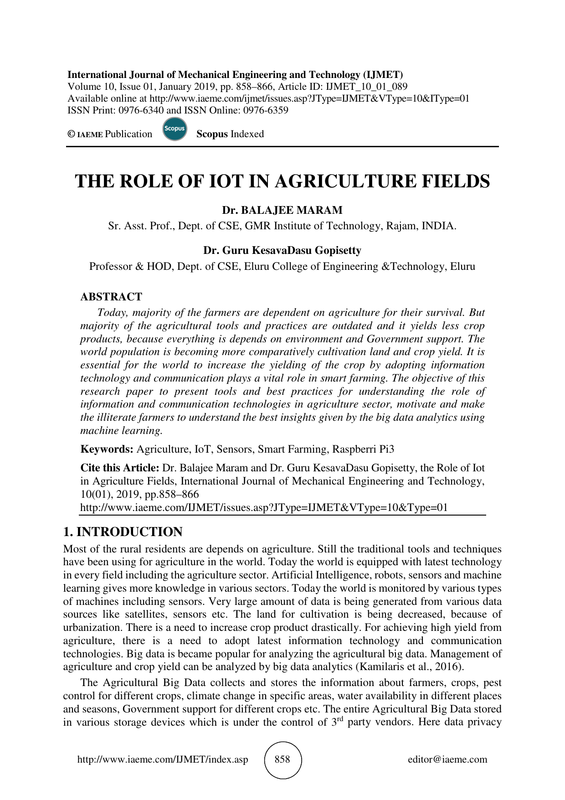 agriculture and crop yield can be analyzed by big data analytics (Kamilaris et al., 2016). using drones for collecting and maintaining the data of different crops, pests, water facilities etc. and display the temperature and relative humidity, and is programmed using python language. temperature and humidity from any part of the world. We can get present information regarding temperature and humidity in a particular place. in raspberry pi 3 model B. It is very useful for industries, pharmacies as it is used to detect the temperature. Accessible from anywhere, efficient, user friendly. help of jumper wires. The jumper wires must connect to GPIO pins of the raspberry pi3 model b.
shows how the object “user” interacts with others “Raspberri Pi” and “database”. the current climate, based on water level, based on price supported by Government etc. • Firstly make wifi connection into shared mode. • Connect the raspberry pi to the laptop using USB cable and ethernet cable. • Then advanced IP scanner is used to scan the IP address of raspberry pi. • After that putty and Xming server is used to view the GUI interface. Enter IP address in the host name field. Now open SSH and in that double click X11 , then enable X11 Forwarding. Secure Socket Shell (SSH) provides administrators to access a remote computer securely. tools that don't have a CLI interface. values of both temperature and humidity. humidity values. And then these values are stored in the database with corresponding date. Kim, G.H., Trimi, S., Chung, J.-H., 2014. Big-data applications in the government sector. Commun. ACM 57 (3), 78–85. bile services. Int. J. Software Eng. Appl. (IJSEIA) 10 (1), 257–270. Schuster, J., 2017. Big data ethics and the digital age of agriculture. Am. Soc. Agric. Biol.Eng. change scenarios: a support vector machine approach. J. Hydrol. 330 (3), 621–640. (IRJET), Volume: 03 Issue: 10 | Oct -2016, e-ISSN: 2395 -0056, p-ISSN: 2395-0072, pp.713719. Applied Science (IJRIAS)|Volume II, Issue V, May 2017|ISSN 2454-6194, pp.19-21. Information Processing 2015, D. Li and Y. Chen (Eds. ): CCTA 2014, IFIP AICT 452, pp. volume 40, number 1, pp. 79–96. doi:10.1093/aepp/ppx056. Special Issue on Computational Science, Mathematics and Biology IJCSME-SCSMB-16March-2016 ISSN-2349-8439, pp.110-113. review, Agricultural systems, 153 (2017), pp.69-80. Publications, Volume 3, Issue 1, January 2013, ISSN 2250-3153. Electronics Engineering (IJCTEE), ISSN 2249-6343, Volume 1 , Issue 2.
journal of Cryptology, 3(1): 27-41.
based on graphical SAC, International Journal of Computer Applications, 2(5): 1-7. Technology, 8(9), 2017, pp. 966–972. Technology 9(2), 2018, pp. 389–397.